Pipelines are the most economical and safest way to transport mineral oils, gases and other products. Every day millions of tonnes of liquids and gases are delivered through overland and on-site pipelines. As mass transport facilities, often over long distances, pipelines must fulfil strict requirements for safety, availability and environmental protection – and for good reason. According to US DOT Pipeline and Hazardous Materials Safety Administration (PHMSA), about 11 462 pipeline incidents occurred from 1997 to 2016 in the US alone. Leaks in pipelines must be detected and located as quickly as possible. Traditionally, operators have achieved this using conventional systems that monitor critical pipeline parameters without any safety functionality. Now, pipeline safety and profitability can be significantly boosted by the world’s first hybrid solution from HIMA, comprising an SIL3 safety controller and a leak detection and localisation system. Leaks form a considerable safety risk. Product outflows of liquids or gases might endanger the aquatic environment, might be harmful to health or flammable. Initiating countermeasures quickly in the event of a leak is essential for minimising the resulting damage. Apart from the risk to people, the environment and reputation, pipeline leaks can lead to considerable financial losses (Figure 1) due to the value of the leaking product. These losses relate directly to the time taken to detect a leak. Yet, in many cases the clean-up expenses and fines are much costlier. In addition, insurance companies can factor the leak detection technology into their policies or refuse coverage if a suitable system is lacking. The four biggest leak detection system challenges facing pipeline operators are excessive false alarms, failure to detect leaks, lack of leak localisation, and costly or complicated maintenance. Conventional systems are generally prone to measurement errors and are dependent on sensor positioning. It is not usually possible to determine the nature of the leak, and configuration is often difficult. Download HIMA’s whitepaper “Smart Pipeline Management” to find out how you can minimise false alarms and reduce losses and liability risks, while fulfilling safety and cybersecurity requirements with a new hybrid pipeline management solution. The new FlexSILon PMC pipeline management solution is the first to combine leak detection with emergency shutdown. It not only protects the facilities concerned but also manages and controls safety-related processes (Figure 2). This integrated hybrid solution comprises a SIL3 safety system and a leak detection and localisation system. Flow rate monitoring is embedded in the SIL3-capable HIMax safety hardware, with pressure and temperature data transmitted to the control centre for visualisation via HIMA’s SafeEthernet protocol. 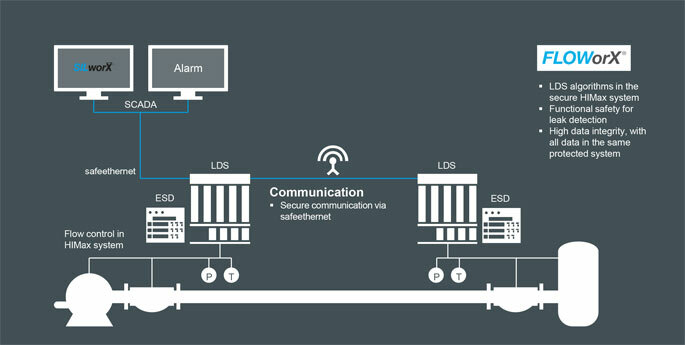 The HIMax systems are also interconnected over SafeEthernet, so each system knows the state of the overall pipeline. If a leak occurs, the HIMax controller automatically adjusts the flow, and shuts down the pipeline immediately in an emergency. This way the system can prevent or significantly reduce damage. The safety controller is based on HIMA’s XMR technology, which combines SIL3 safety hardware and software with a scalable, fault-tolerant architecture to avoid false alarms. An important part of FlexSILon PMC is the FLOWorX software for leak detection and localisation. Pipeline flow rates, pressures and temperatures remain constantly visible to operators, and anomalies are reliably recognised. Along with the main functions of leak detection and localisation, the software supports batch and gauge tracking as well as data archiving and analysis. The system also accommodates pressure and temperature correction calculations. Operators can also flexibly adapt the detection algorithms to their specific needs. Unlimited changes, modifications, extensions, improvements and even prescribed verification tests during ongoing system operation according to the SIL3 standard are possible. The system can be integrated into virtually every automation environment through open interfaces. Components from other suppliers can also be integrated. Along with the automation components necessary for gas and liquid pipeline management, control and monitoring, the package includes customer support and service. Download our whitepaper “Smart Pipeline Management” to learn about the new approach to pipeline management that combines leak detection with an SIL 3 safety control system. As a result, you can minimise false alarms and reduce losses and liability risks, while fulfilling safety and cybersecurity requirements.